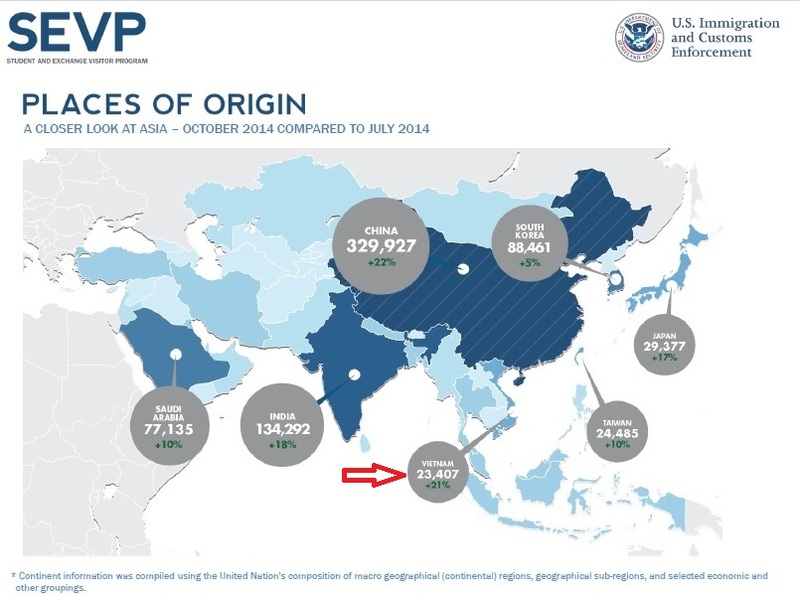 HomeOver 23,000 Vietnamese Students in the US! 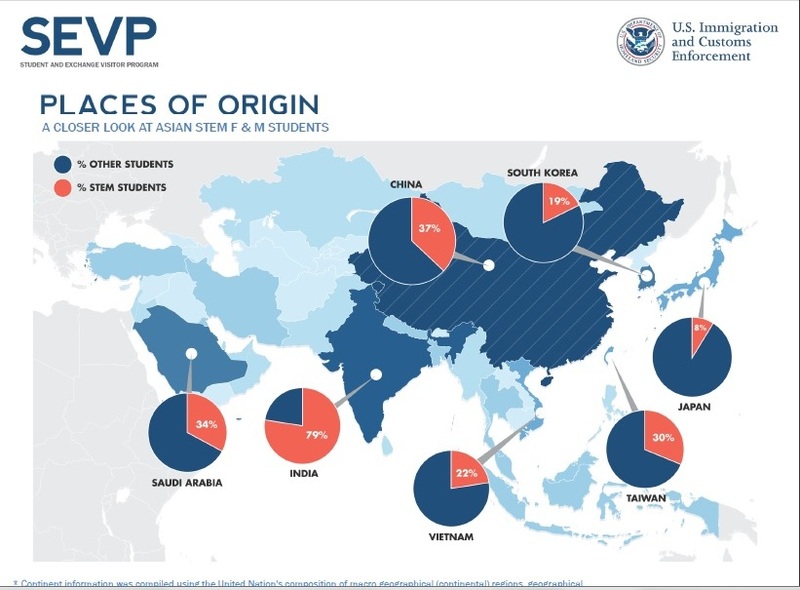 Over 23,000 Vietnamese Students in the US! While the Open Doors 2014 numbers are impressive, the latest SEVIS by the Numbers statistics are remarkable. As of last month, i.e., the current fall term, there were 23,407 Vietnamese students in the US at all levels. That represents an astounding 21% increase since July 2014, second only to China (22%). This means that Vietnam is one of the fastest growing markets in the world for US-bound international students. Why? In a nutshell, growing ability to pay and increases at both the postsecondary and secondary levels. SEVIS by the Numbers (PDF download – October 2014) is a statistical summary report produced using data compiled from SEVIS. The quarterly review below is based on information retrieved on 7 October 2014. The last update was in July 2014, when there’s usually a dip in the numbers because of June graduation. SEVIS (Student and Exchange Visitor Information System) came online in 2003 to track and monitor the status nonimmigrant students and exchange visitors who enter the U.S. This web-based system collects real-time information on these two groups, plus approved schools and program sponsors. One of the reasons I prefer these updates is that the data are real-time not a year old, as with the IIE’s annual Open Doors international academic mobility reports, mentioned in the previous post. Another difference is the SEVIS reports include all levels and types of education and training, while Open Doors only includes information about regionally accredited institutions of higher education. In short, the SEVIS updates offer an up-to-date and comprehensive overview of international enrollment trends in the US higher and secondary educational systems. It would be helpful if the report separated the postsecondary from the secondary statistics but I’m guessing that would require a Freedom of Information Act (FOIA) request. 30% of all F & M students are from China (i.e., 329,927), followed by 12% from India. Rounding out the top ten are South Korea, Saudi Arabia, Canada, Japan, Taiwan, Vietnam (#8), Mexico and Brazil. 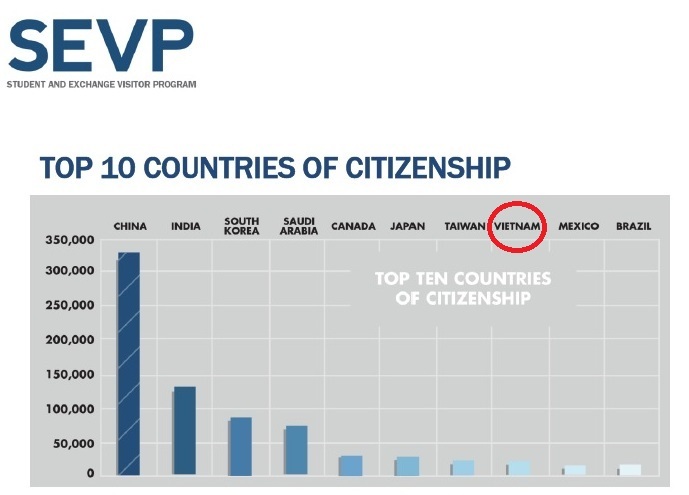 Vietnam continues to lead the third tier of “top ten” countries. (China is in a league of its own, statistically speaking.) My guess remains unchanged, namely, that Vietnam will surpass Taiwan and Japan in the next few years. Since July 2014, the total number of SEVIS records for active F & M students, exchange visitors and their dependents increased by 8.98 percent, from 1,345,276 to 1,466,102. 73% of active students are enrolled in bachelor’s, master’s or doctoral programs. 47% of all F & M students enrolled in computer and information sciences and support services programs are from India. There was a 40% increase in the number of all F & M students enrolled in secondary school degree programs since July 2014. Of SEVIS-approved schools with active students, the visa distribution is as follows: 76%/F & M; 13.7%/J. Finally, here is a graphic that looks at places of origin in Asia for STEM (science, technology, engineering and mathematics) F & M students. 22% of all Vietnamese students are in STEM fields.